When driving on Parisian highways, beware of vehicles stopped on the shoulder, unexpected weather delays and, of course, massive and hypnotic optical illusions. 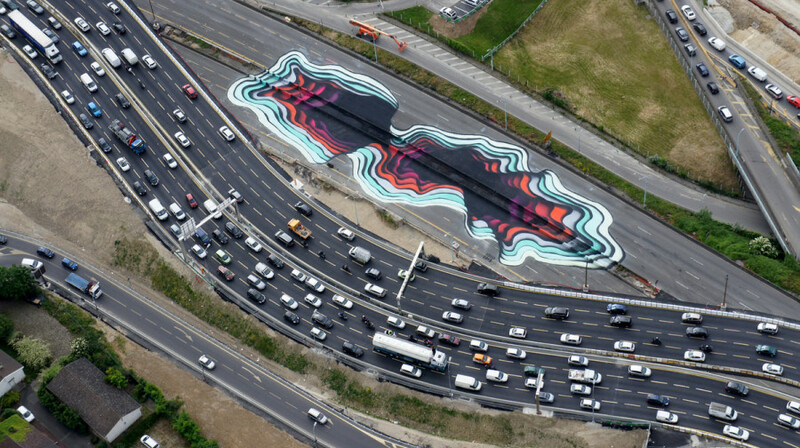 For example, this stunning work of tripped-out street art, measuring in at nearly 400 feet long and 100 feet wide, could cause an otherwise cautious driver to enter a mode of artistic reverie, potentially jeopardizing others on the road. For this, we thank German street artist 1010, who has made Paris' Boulevard Périphérique a little more spooky and a lot more beautiful. "I like to play with the perceptions of human beings," 1010 told The Wall Street Journal. "Sometimes we think something is static but it’s not. If you change the perspective you see it in a different way." 1010 created his psychedelic masterpiece over the course of seven days, with the help of two assistants and 400 liters of paint. The bold imagery manipulates line and color to give the feeling of depth, creating the impression that there's a psychedelic cavity on the well-known stretch of highway. Don't be too alarmed though, traffic is currently being diverted from the site of the work. The artist expects the image to travel primarily via iPhones and social media; those living or working in tall buildings in close proximity to the work are the only ones lucky enough to catch a glimpse in person. A graduate of the School of Fine Arts in Vina del Mar, Chilean artist INTI is inspired by South American pop culture, pre-Columbian art and the contemporary history of his country. Abdellatif Farhate, of Casablanca, paints under the name Kalamour. His creative process combines portraits, elements of sacred geometry and fantastic figures. Cisco is a major figure in the Spanish graffiti scene. The tattoo artist features abstract works where the attitude and position of the character take precedence over realism. Based in Turin, Pixel Pancho is famous for his gigantic murals of robotic creatures. He draws inspiration mainly from surrealist works by Salvador Dali and Impressionist Joaquín Sorolla. C215 leaves his mark wherever he goes. This stencil artist uses wild colors with extreme precision. A specialist in calligraphy, Zepha, aka Vincent Abadie Hafez Zepha, took part in the graffiti movement in France in the 1980s. His lyrical, geometric compositions catch the eye -- and the heart. Hailing from Argentina, Jaz started working on graffiti in 1999. Inspired by "Lucha Libre" (Mexican wrestling), his works depict colorful clashes between man and beast. A graduate of the Ecole des Beaux-Arts in Casablanca in 2003, Simo Mouhim's graffiti is dominated by shades of gray. Ukrainian-American mural artist Maya Hayuk creates compositions that commingle geometric abstraction and riotous color.